PÜR’s encapsulated water complex delivers Swiss Alps-sourced mineral water deep into the skin to hydrate for lasting radiance. 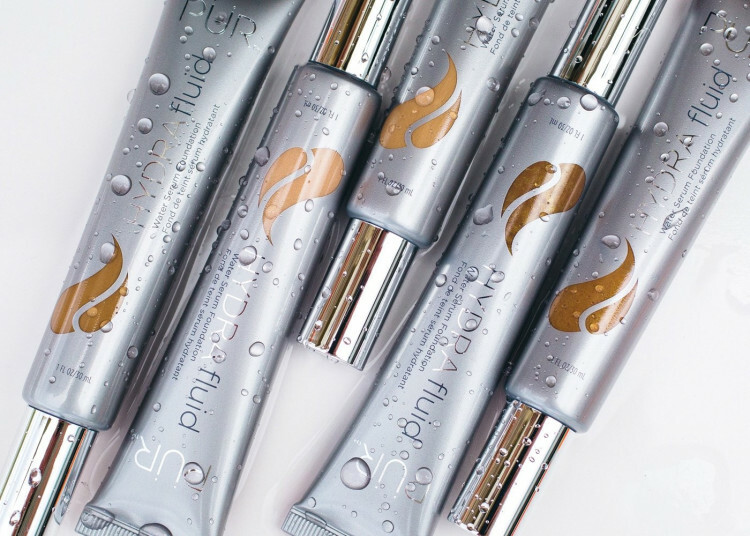 HydraFluid’s lightweight formula satisfies the desire for dewy, breathable, luminous-looking skin and a bare-looking but perfect complexion. 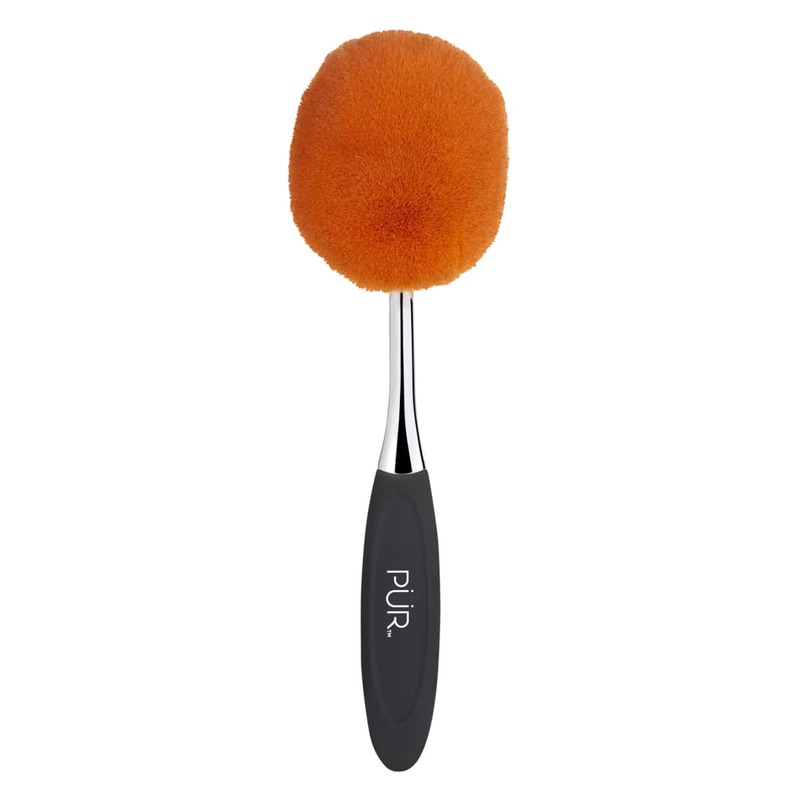 Use the Chisel Brush to dust on 4-in-1 Pressed Mineral Makeup over HydraFluid Water Serum Foundation. Further define brows with Wake Up Brow Dual-Ended Brow Pencil. Apply Mineral Glow Bronzer in a “C” formation along temples and under cheek bone to add a golden glow. Apply Eye Polish Base + Top Coat in Caviar for a shimmery, smoky eye. Coat lips in Lip Lure Hydrating Lip Lacquer in Mystic. Love this foundation. It goes on very nice and doesn’t cake on me. I really like the coverage. It is smooth and light and can be layered. I feel like it "breathes"
This Hydrafluid Water Setum Foundation was just what I’ve been looking for. I’m someone who wears a small amount of makeup. Basically the type who just wants to smooth and even out my natural skin. Not only do I live in an incredibly dry and airid high desert but my skin seems to dry out if it just looks in the direction of foundation. This product does exactly what it says and I feel great in it all day long. I have combination skin and the Chicago winters are brutal on my face. I love that this has a dewy look, and keeps me hydrated. It may be too much in the summer, but for now I can't get enough! I love this foundation! My skin looks flawless. Please don’t discontinue this product it your best foundation!! The Hydrafluid water serum foundation by Pur is a whole different level off beauty. It has flawless coverage. My skin feels wonderful after use. I can't say enough about this product. Thought I'd give this a try since my skin gets dry in winter but this is the worst foundation I ever purchased. It is a very thin runny foundation and made my skin look like I smeared vaseline all over my face. It is SUPER shiny and greasy looking even after putting the 4 in 1 powder over it- the shine comes back. I'm very disappointed considering how much it cost. definitely don't recommend this. I went back to clinique. Doesn’t provide as much coverage as I had wanted but still goes on great and smoothe! Do recommend. I most definitely would recommend best foundation. It has very good coverage and does not feel heavy on your face and I will purchase again. This is the only product that is full coverage and moisturizing at the same time. It works so well on my dry skin. It even covers my age spots. It is definitely worth the price, which isn't a lot! I now have my mom using this stuff! Excellent product! Very lightweight and maintains all day. This is a great foundation for those that break out easily or who want light coverage. Perfect match, very hydrating and long wearing. Great even coverage but feels light. My skin looks smooth and clear. I feel like my skin has changed for the better since I’ve started using it. THE BEST FOUNDATION EVER INVENTED! I WILL NEVER WEAR ANYTHING ELSE!!! I absolutely love this product and would recommend it to anyone! Especially anyone with dry skin. Almost every kind of foundation hydrating or otherwise that I have tried ( and I have tried ALOT) dries out my skin and flakes horribly. BUT NOT THE PUR HYDRAFLUID WATER SERUM FOUNDATION!! I will never use anything else! So lightweight, stays on in this crazy heat, and looks so natural and even adds moisture. I am just getting used to it. I think I should have gotten a shade lighter. This is my favorite foundation. It is so light and easy to apply and blends so easily. I’m older and have good complexion so I don’t like the heavier foundations. This has a little moisturizer and doesn’t turn “cakey” by the end of the day. The only reason I didn’t give it 5 stars were the limited shades. Would love to see a porcelain shade! I've used the 4-in-1 Pressed Mineral Makeup Foundation every day for almost a decade, but this foundation is giving my original love a run for its money. It feels so smooth and it blends beautifully, and it covers my redness and blotchiness perfectly. Love it. Ordered as a backup for the cushion foundation while it was on sale for Black Friday. I love the feel and though I'd not call it full coverage, it gives a nice sheer blendable and buildable coverage that does not dry your skin. Absolutely love it. Goes on smoothly. I am 64 years old and have great skin. I found my other foundation was just not looking like it should. So I decided to give this a try. Feels like I have nothing on nor does it weigh me down.